Honda Cars Philippines, Inc. (HCPI) opens its 35th full-service dealership, Honda Cars Lipa City (HCLC). The dealership, located at Ayala Highway, Brgy. 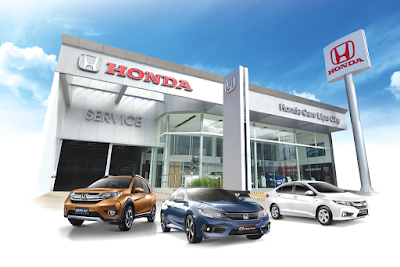 Balintawak, Lipa City, Batangas is the first dealer in the Philippines to apply the new Visual Identity, which enabled the Honda dealers perceived to be advanced, futuristic, and modernly elegant. To see the line-up of Honda vehicles displayed, HCLC showroom is open every Monday to Sunday, 8:00 AM to 7:00 PM. To further extend help and assistance to availed Honda cars, the service facility is open every Monday to Saturday, 8:00 AM – 5:00 PM. Modernly designed to provide a comfortable ambiance to customers, the showroom can accommodate up to 5 vehicles for display. HCLC has well-trained sales consultants to serve the clients as part of Honda’s commitment to provide quality service to the Filipinos. Equipped with state-of-the-art facilities and equipment for the Batanguenos, HCLC is also available to serve its customers with their availed Honda cars through the help of skillful technicians devoted in providing world-class services. “Dedicated in continuously providing utmost customer satisfaction in the city of Lipa, HCLC will surely provide a unique experience that will make customers go back and trust Honda.” said Mr. Anthony N. Cheng, Chairman of ANC Group. Honda Cars Lipa City will be another center of excellence that would continue to showcase the impeccable service system Honda Cars Philippines Inc. persistently offers, which revolves around customer satisfaction.